There’s a new study in town that says, when it comes to multiple-choice questions, don’t go with your gut. There’s a new study in town that says, when it comes to multiple-choice questions, don’t go with your gut. 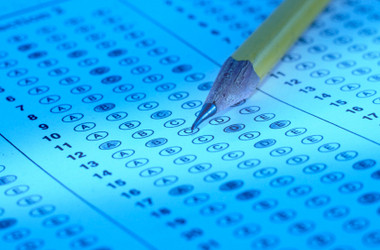 It’s been pounded into our brains that our first instinct on test answers is the way to go but, according to new research data, test takers actually increased their scores when they changed their answers on multiple-choice questions. The study evaluated the response change patterns of more than 8,000 students from 37 countries while taking multiple choice exams. More specifically, the evaluated test takers were taking the Quantitative Reasoning and Verbal Reasoning sections of the GRE revised General Test. The response change patterns included changing responses from blank to the final response, wrong to the final response or right to the final response. According to the results of the study, the majority of test-takers (between 71.7 and 77.1 percent) actually gained higher scores after changing their original answers. “The results of this study disprove the fallacy that the first instinct is always correct when answering multiple choice questions,” said Lydia Liu, Senior Research Scientist at ETS. Liu continued, “It is important that students know the research supports response changing when there is a good reason for doing so.” Public opinion, however, seems to sway towards the myth. When surveyed, 59 percent of test-takers believed that the original answer was more likely to be correct – the opposite of the findings in the recent study. “Despite test-taker perception, the empirical results suggest that the majority of the respondents had a score gain as a result of answer changing,” said Liu. When the General Test was introduced in 2011, the GRE Program began to allow the ability to skip questions and/or change answers on the exam. It is seen as a more test-taker friendly version, where those taking the exam are able to utilize their own personal test-taking strategies during the exam. So, next time you’re stuck on a question, remember that you may be tempted to change an answer for the right reason – literally.